Night walk in Borneo rainforest always excites me, as I would stumble upon something cool, weird or even creepy. Besides firefly, many bugs can glow. Many had been telling me about a worm that glows in the dark but I never saw one. My luck came when I did a night walk in Crocker Range Park two weeks ago. As it was a cold night in the month of Ghost Festival, it was kind of eerie to see something like ghost fire moving in the dark. When I shined my flashlight to the yellow-green color glow, I saw only a bug crawling on forest floor. When I moved the light away, the glow appeared again. Then I confirmed that this bug emitted the light. It looks more like a millipede though. 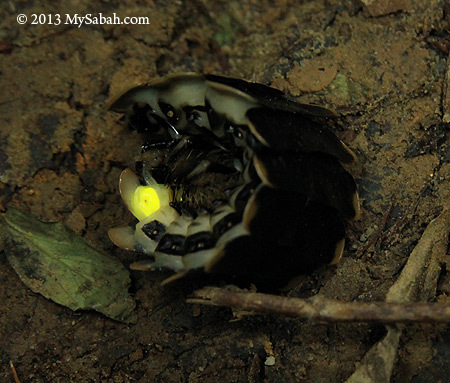 You have no idea how happy I am to see glow worm the first time, I’ve been looking for for one for years! 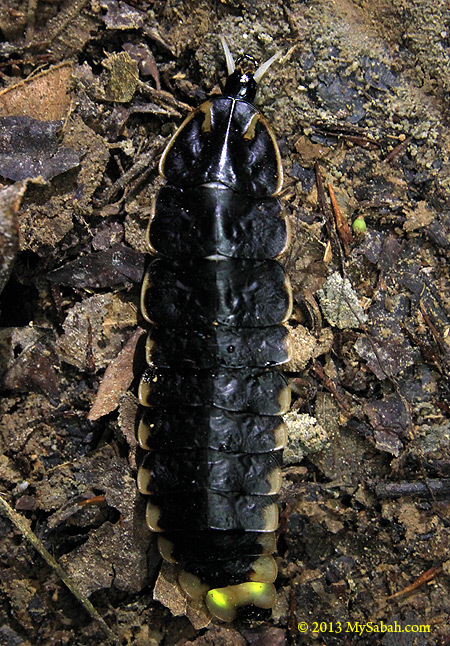 This glow worm is a larvae of the beetle from Lampyridae family (Thanks to Arthur Y.C. Chung for the ID). In the photos, you can see the yellow light on its tail, which glows through bioluminescence (the production and emission of light by a living organism). The glow is a “cold light” and it serves as a warning signal to predators such as frog. 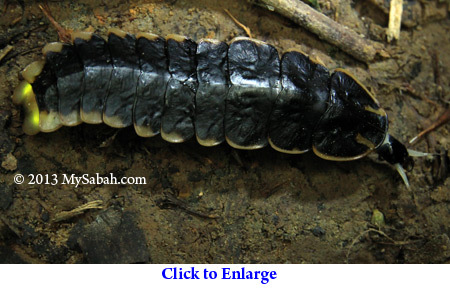 In fact, this larvae is mildly toxic. I put it on my hand and felt that its body was cold. Cool huh? I know there are other types of glow worm. I’ll share with you if I see more. Wish me luck.